Uric acid (UA) calculi can be referred to chemolitholysis rather than invasive treatment. Dual-energy computed tomography (DECT) may be able to distinguish between UA and non-UA (NUA) calculi. The aim of this study was to evaluate the validity of third-generation DECT for the first time and to investigate whether combining DECT with clinical parameters can increase its predictive accuracy. All patients who presented to our emergency department between January 2015 and March 2017 with urinary stones were prospectively included in this observational study and underwent DECT with subsequent interventional stone removal. Stone composition was analyzed using infrared spectrometry as the gold standard. Predictive accuracy of DECT and clinical covariates was computed by assessing univariate and multivariate areas under the curve (AUCs). 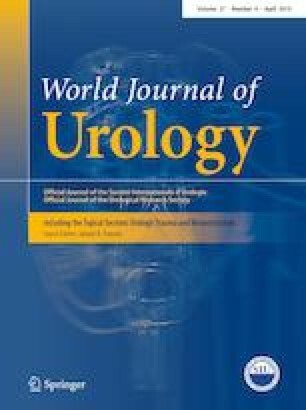 Of 84 patients with 144 urinary stones, 10 (11.9%) patients had UA stones according to infrared spectrometry, and the remaining stones were NUA or mixed stones. DECT had a positive predictive value of 100% and a negative predictive value of 98.5% for UA stones. The AUC for urine pH alone was 0.71 and 0.97 for DECT plus urine pH. No UA stones were found in patients with a urine pH above > 5.5. Mean DLP was 225.15 ± 128.60 mGy*cm and mean effective dose was 3.38 ± 1.93 mSv. DECT is a safe method for assigning patients to oral chemolitholysis. Clinical preselection of patients based on urinary pH (< 6.0) leads to a more liable use of DECT. Third-generation DECT needs significant lower radiation doses compared to previous generations. American Journal Experts assisted with manuscript editing. TN project development, data collection and management, data analysis, and manuscript writing. KN data collection and manuscript editing. AN project development and manuscript editing. HI data analysis and manuscript editing. CN manuscript editing. SW manuscript editing. HUS supervision and manuscript editing. CR project development, supervision, and manuscript editing. This work was supported by the German Ministry of Defence. The study complied with the Declaration of Helsinki and local ethics committee approval (15-01-27) was obtained. All patients provided written informed consent prior to their DECT examinations.